THE AUSTRALIAN BALLET IN 'THE SLEEPING BEAUTY'. PHOTO BY DANIEL BOUD. 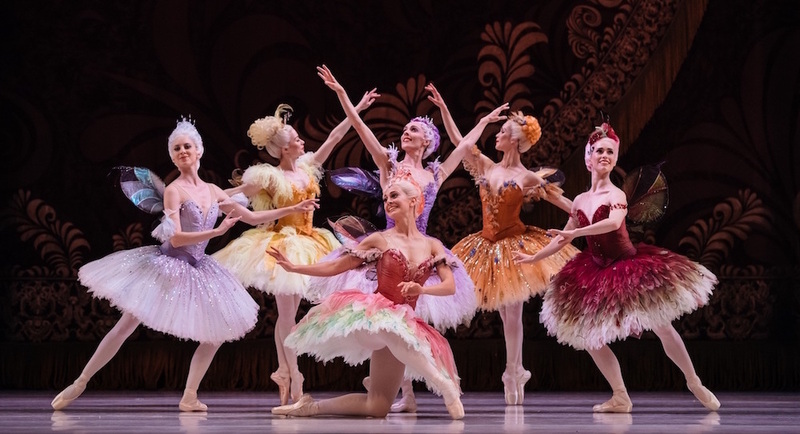 Currently showing at the Capitol Theatre is The Australian Ballet in a revival of David McAllister’s version of The Sleeping Beauty, which we first saw in 2015. It has been minimally tightened and tweaked. The story follows the traditional fairytale plot: Princess Aurora is born and at her christening is endowed with gifts from the fairies and cursed by the bad fairy Carabosse with death by pricking her finger when she is 16 in revenge for not being invited. However, the Lilac Fairy commutes the death sentence to a century of sleep and declares that all will eventually be well – Aurora will eventually awake to true love by a kiss from a Prince and will live happily ever after. The Australian Ballet in ‘The Sleeping Beauty’. Photo by Daniel Boud. It is an extremely opulent and lavishly presented work, featuring 300 bespoke costumes, 100 wigs and hats, and 130 pairs of fairy wings. Altogether, it is rumoured to have needed 5,000 metres of tulle, and they are full of intricate layers and detailing. Whether you like and/or admire designer Gabriela Tylesova’s costumes is probably a matter of personal taste. I was a little disappointed perhaps in some of the colour choices and overly fussy designs at times, and sometimes the clarity of the dancers’ line was broken, but I can certainly appreciate the extraordinary attention to detail in the construction and design. Technically, the dancing is outstanding, and I saw Leanne Stojmenov as Aurora, who was breathtaking. 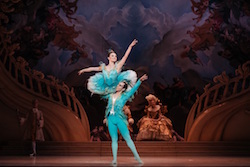 McAllister’s choreography is very traditional and heavily based in the style of Petipa where necessary, and the intricate patterns for the nymphs, fairies, friends and the Garland Waltz, for example, are fascinating and meticulously performed. The fairy solos can be quite challenging but were terrifically danced. The cavalier’s choreography was a splendid showcase for the male dancers. The four princes in the Rose Adage were formidably danced. The mime was clear and understandable. The setting was 17th century France in a palace inspired by Versailles, with soft pastel shades blending with gold and cream and bright reds. The supporting marble columns of white and gold look like ice cream swirls (or perhaps narwhal spirals?). 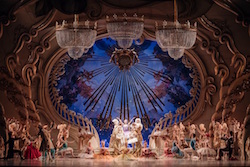 There is a wonderful carved and painted front set instead of a curtain, and the spectacular chandeliers rising at the start of Act 3 received a round of applause. The Australian Ballet’s Kevin Jackson and Lana Jones in ‘The Sleeping Beauty’. Photo by Daniel Boud. The overdone use of pink and green in Act 1 for the Garland Waltz was way too saccharine for my taste, nearly causing you to die of visual sugar overload. I was perhaps a little bothered by the key symbolism and the casket, Fabergé egg-shaped, with a bed of roses that Aurora sleeps on. Our Aurora, Stojmenov, was magnificent. In the Rose Adagio in Act 1, she was incredible, with amazing steely control in the balances. She was charming and yet regal with magnificent, fluid épaulement and glorious slow unfolding of her développés. In the grand pas de deux in the final act, she was radiant, and the tricky fish dives were glittering and spectacular. Ty King Wall as Prince Desire was excellent with fabulous ballon, soft jumps and lots of elegant cabrioles, jetés and turns. As the Lilac Fairy, Nicola Curry was tremendous, a messenger of calmness, sweetness and light in some dangerous situations. Yet she also has hidden authoritative power. Franco Leo has much fun as the busy, fussy Catabalutte. As Carabosse, Gillian Revie was malignantly evil in a wonderfully feathery black outfit. She seeks revenge for being slighted and not invited to the christening. Her attendant mice leap and slither menacingly – shades of Graeme Murphy’s Nutcracker? 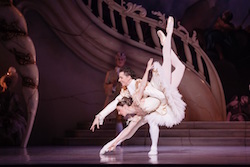 The Australian Ballet’s Jade Wood and Marcus Morelli in ‘The Sleeping Beauty’. Photo by Daniel Boud. Watch out for the Bluebird pas de deux in Act 3 – I saw Shaun Andrews and Jade Wood, who were quite eye-catching. It would be an enchanting work to take young children to. The ones in the audience the night I attended loved it. The work concludes in full Baroque splendour in gold and white as Aurora and Prince Desire are united with a shower of gold confetti.